Writing an article about Pulmonaria seemed to be quite easy at the first view since Pulmonaria had been relegated to grandmother’s shade garden for so many years. The last thing a self-respecting gardener would do in the past, was to give a so-called old fashioned plant like Pulmonaria a place in the garden. However, when I gain more in-depth knowledge about the subject Pulmonaria, I found out that Pulmonaria are becoming more and more popular. It is quite remarkable that the last few decades nearly 100 varieties have been introduced. Garden designers are aware of the surplus value of Pulmonaria in the garden. It is nearly the earliest bloomingperennial for shade with blue; red; violet; white colours and sometimes having red-pink flower buds, opening up to reddish-violet and then turning blue as they become older. Also the leave colours show more diversity; green leaves; spotted leaves and even silvery white leaves without showing any green on them. Pulmonaria wonderfully combine with bulbs; Dicentra and Corydalis and could be mixed planted with Astilbe; Epimedium and Hosta. The revival of Pulmonaria is a fact. Pulmonaria belongs to the family of Boragináceae. This family is a substituted plant community of Borágo, an old Latin name of unknown provenance. The name Pulmonaria has been derived from the Latin name pulmo(pulmonis) which means: lung. In the Middle-Ages, herbalists believed that the spots on the leaves of the Pulmonaria have borne a resemblance to lung histogenesis and the colour of the flowers should be similar to the colour of the lungs. This all has lead to the theory that the Pulmonaria(officinalis)is a medicinal herb, being a remedy against lung deseases or having a beneficial effect, on the lungs and to cure that particular part of the body. 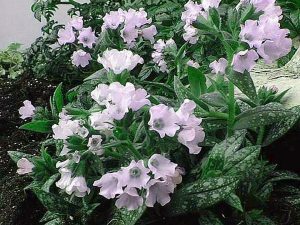 The active elements in Pulmonaria are for example: mucilages; acids; tanning material; saponine; quercetine; minerals and Vitamin C.
For internal use: bronchitis; inflammation of the mucous membrane(catarre); haemorrhoids; diarrhoea. For external use: fresh leaves are used as a wound bandage; fresh leaves are used for chest massage in case of cough and bronchitis and as an eye wash. The young fresh leaves of Pulmonaria also can be used in salads and soups and the older leaves could be cut at the end of the Spring / beginning of the Summer to be dried for producing homoeopathic medicines(Herba pulmonariae; Folia pulmonariae). Pulmonaria consist of about 12 common grown species of hairy herbaceaous to evergreen perennials, widely spread from Europe to the Caucasus and Russia. In the wild, they usually grow in deciduous woodlands. In general Pulmonaria like moist soil, but many of the named varieties do very well in average garden soil(drier) too. Pulmonaria are perennials that grows from a basal rosette. The leaves are large, low growing with hairy tops and undersides. Not all the varieties are spotted. Some have green leaves, others are silvery white. Most of the Pulmonariakeep their leaves in Winter and become deciduous slightly in Spring, just before the re-growth begins. Pulmonaria augustifolia….it means, having respectable, elevated foliage. This specie has lanciolate, elongated unspotted leaves. At first the flowers are carmine-red, later on changing into cobalt to azure blue. Pulmonaria augustifolia Alba is a pure white one. Newer introductions are: Beth’s Pink; Blauesmeer(dark blue); Munsted Blue(pale blue); Mawson’s Blue and Johnson’d Blue(gentian blue). Pulmonaria augustifolia is suitable for forcing. Pulmonaria officinalis….workshop of a chemist’s; therapeutic. This species is native from Holland to Sweden, Italy and Bulgaria. It is rarely seen in gardens. The leaves usually are white-spotted. It likes moist, peaty soil and is found in mixed deciduous forests. It is a self-seeding specie flowering in March/April. Pulmonaria officinalis Immaculata is an unspotted form of the species. The variety Alba has spotted roundish leaves and white flowers. Pulmonaria officialis Sissinghurst White is the only known clone of this species. Pulmonaria rubra (syn. 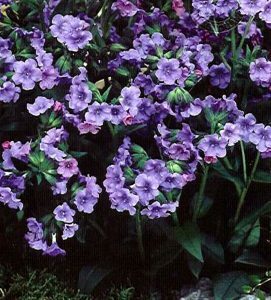 Pulmonaria Montana; grows in mountainous, hilly areas) reaches a length of 45cm and is found in the Carpathian and the Balkan. The leaves are not spotted pale-green. The variety Albocorrolla is a white flowering form; Barfield Pink has deep green leaves and pink flowers. Redstart medium green leaves with coral red flowers. A real stand out in the landscapeis the variety DAVID WARD, having mint green leaves with wide variegated white edges and coral coloured flowers. Pulmonaria saccharata. Saccharata derives from the New Latin saccharäre, which means: containing sugar; sugary. Synonyms are: Pulmonaria picta which means multicoloured or spotted and Pulmonaria affinis which means: close related to another species. Pulmonaria saccharata resembles Pulmonaria officinalis. Pulmonaria saccharata is an evergreen variety and native in France and Italy. This species is not hardy in most of the European countries. The best and most interesting variety so far is Pulmonaria saccharata Argentea or Argentifolia. Argentea means: silvery or silvery white. The leaves of this variety look silvery frosted; the flowers are pink and turn blue. Other varieties are: Bowles Red; Janet Fisk and Margery Fish which is a variegated one. Pulmonaria stiriaca is originated from the East Alps. This species has very attractive leaves; upright stems carrying azure blue flowers. According to Pulmonaria lovers, promising new varieties are coming up. It is said that Dan Heims from the USA is a respectable Pulmonaria breeder, nevertheless, if one is asked the question: “which is the best Pulmonaria” they speak with one voice only,it is PULMONARIA “MAJESTÉ” a French introduction. Tony Avent, an highly esteemed specialist says: “Pulmonaria Majesté is my favourite one. It has velvety leaves of pure silver….not a speck of green on the leaves even”!! The history of breeding Pulmonaria shows that it is not that easy to get a real “break through” in breeding Pulmonaria. Despite all the attemps nobody was able to driven away Pulmonaria Majesté from the top, successfully, though the variety is over 20 years old now. It still is waiting lonely for a partner Pulmonaria. 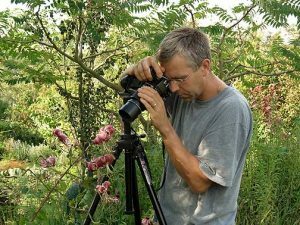 It was in 1985, that Mr. Didier Willery, just when he left school, got ajob at the nursery “La Ferme Fleurie” owned by Mr.Hennebelle and located in Northern France. One day, Didier found in a big clump of Pulmonaria two silvery leaves. Didier divided the plant, trying to get this remarkable mutation out, but did not succeed. He only got the leaves separated.The roots remained in the soil. Having no choice, Didier put the leaves in a glass of water and to his surprise, these leaves got rooting after a couple of days. He and his boss , Mr. Hennebelle, decided to call this mutation Majesté. 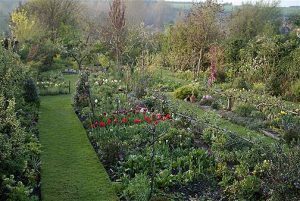 He successfully built up a small stock, propagating the plants by division and at the end of the eighties they started selling the variety. Didier left the company in 1991 and became a well-known FrenchGarden journalist. He is a member of the Pulmonaria group of the HARDY PLANT SOCIETY. Nowadays he has his own show garden, growing all the plants himself he wants to talk or to write about and of course, Pulmonaria Majesté has a prominent place in his garden. At the end of the ninetees, Didier found another seedling in his garden, having very long and small silvery leaves. It looked like a cross between Pulmonaria Majesté and Pulmonaria longifolia which were planted next to each other. Because of the leaf-shape, looking like a sword, he called the variety SAMOURAI. Please, find at last some prescriptions. Put 1 tea spoon Pulmonaria; 1 tea spoon Plantago and 1 tea spoon pounded fennel seed(Foeniculum vulgare) in a cup and brew the tea for 10 minutes and sip it. The recommended quantity is 3 cups a day. Put a handful of fresh Pulmonaria leaves, a wisp of fennel and 350 grams dark candy sugar in 1 litre of water and boil it till half a litre is left. Take 3 times a day a tea spoon of the extract.